This dish is so easy, there is really no need for a recipe. But just for the sake of documenting the things we cook and eat, I shall post the how-to here. The main thing to remember when cooking this dish is DON’T OVERCOOK IT! Sea scallops (the big ones) can be pretty pricey so you don’t want to waste them by shriveling them up and making them inedible by overcooking. Keep in mind that these are usually served raw in sushi bars so nothing wrong with under cooking them a bit. Also, the secret to getting them pretty is the searing. You have to sear them in high heat in order to get the brown, caramelized color. As for the oil to use, I use ghee most of the time because I like the flavor of butter but using regular butter to sear is not a good idea as it will burn and you’ll get that burnt butter flavor instead. My daughter has been into using coconut oil lately and we’ve also tried that for searing scallops and the flavor is also very good. Different. Alternatively, if you don’t want to use ghee or coconut oil, olive oil also works really well. The scallops are so good on their own that we like to eat them simply with just a side salad or some kind or a rice pilaf or baked potato or steamed veggies. You don’t want any heavily flavored sides to go with these, in my opinion. The only side that goes really good with a dish like this is a great glass of wine. But if you’re in a celebratory mood, maybe some champagne? You can buy champagne online with Jim’s Cellars Australia they have some pretty good deals. Something to keep in mind with the holidays coming up. Pan seared scallops with lemon sauce. Get your ingredients ready. Mash your garlic finely and juice the lemon. Set them aside. Also make sure to dry your scallops thoroughly with a paper towel so that then don't get watery when you start cooking them. Sprinkle the scallops with salt and pepper on either side. Heat up a skillet until it's smoking hot and add the ghee or coconut oil. Your choice. Add the scallops and sear until it gets some color to it. This will only take a minute or two. Turn and brown the other side. 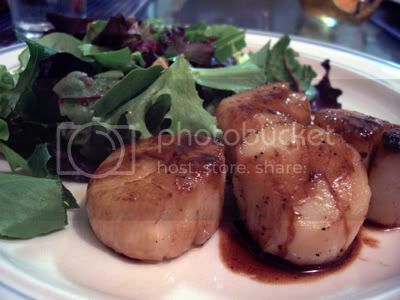 After scallops have browned on both sides, they should be just cooked which is how we like them. Not overcooked. To the remaining oil in the pan, add the garlic and let it cook until fragrant, about one minute. Add the lemon juice and broth to deglaze the pan. Once the liquid is bubbly, add another couple of tablespoons of butter just to make your sauce creamy. Stir only until the butter is incorporated. Turn off the heat and add more salt and pepper to taste. Pour sauce over scallops.